Home / Archive by category "Special Education Procedures"
The Supreme Court may make changes to how our nation serves students with special needs. At issue is whether school districts need to provide a substantial or “meaningful” benefit, which has been the general belief for the last 40 years, or whether school districts can provide “de minimis” services – if the child progresses at all, justice is served. There is potentially much at stake. See this piece from the Washington Post. Supreme Court Case on Special Education, Washington Post. 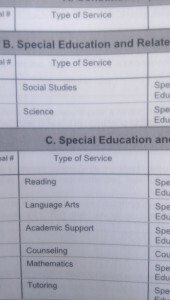 Okay, fellow special educationites, let’s look at the columns of the service delivery grid. Today we’ll just deal with that first column, Focus on Goal #. Remember how I said in the previous post, How to Read the Service Delivery on Your IEP, Part 1, that everything in an IEP needs to refer to everything else? This is a prime example. The Measurable Annual Goals (see my previous post about goals) determine what services will be provided. Let me say that again. The goals in Measurable Annual Goals, IEP4, determine – not guide, not suggest – what services are provided. If there is no math goal, then math should not appear on the service delivery grid. What’s the big deal? you ask. Why does a service need a goal? Here’s the beauty of the IEP. The data about your child’s past performance determines what adult educators, including you, believe your child can achieve in the next year, with a certain amount of support. What your child can achieve becomes the goal. The support becomes the service delivery. So the first column tells the Team to figure out which goals need what support. No goals, no service. As you can see in the photo above, some services will just have one goal in the first column. In the photo above, the child has a reading class with a single goal – reading. You also see in the photo that some services have multiple goals. In this case, the child has a Language Arts class with two goals – reading and writing. You don’t know what the goal titles are unless you go to IEP4, Measurable Annual Goals and look at the numbers. 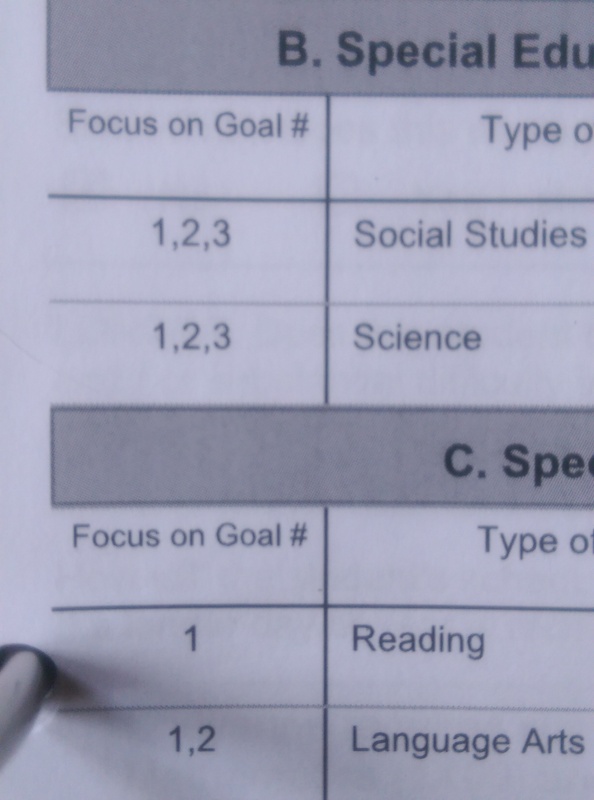 In this IEP, Reading is goal #1. It is good to know what the Goal Number column means. If you have a question about anything in this column, ask the teacher before signing. Sometimes old goals are left on by mistake, sometimes a teacher mistypes a goal number, sometimes a cell is empty, which is not good. These details matter. Sometimes goals end in June, with new goals starting in the fall. If there is a service that goes until the end of 8th grade and does not continue in 9th grade, the IEP needs to show that. I’ll talk about this advanced grid reading in another post! There can be a small difference between which goals show up on which grid. If your child is pulled out of class to see a counselor for an emotional management goal, it will probably be in the C grid, because the C grid is for pull-outs. Academic goals tend to be in the B and C grid, showing that a student is in both general education and special-ed-only settings. As you remember from the other post, the B grid is for services that happen in the general education classroom, and the C grid is for services that happen in specialized environments. When I’ve seen goals in the A grid, they tend to be either really general, like all the academic goals, or very specific, like occupational therapist talking to a teacher. This is a lot of information. Does that make sense? Write me back! Next time, we’ll talk about the Type of Service column. Good job! You knew the answer because you read my post about page numbers in IEPs, right? This fifth section of your IEP will be the topic of a few of my posts. Although the section is (usually) only one page long, it packs in a LOT of information. We’ll take it in steps. Today, we’ll get a general overview and look at three sections created by rows. But teachers are warned not to write this page first when we’re writing IEPs. The service delivery is the end result of a lot of other information. Everything in an IEP needs to reference something else. I’ll write more about that another time. Let’s start with the most general points of IEP5. First of all, that chart you’re looking at is referred to as a Service Delivery Grid. “Where is ‘Service Delivery Grid’ written?” you ask. Nowhere. That’s just what teachers call it. Now you do too, so you’re In The Know. 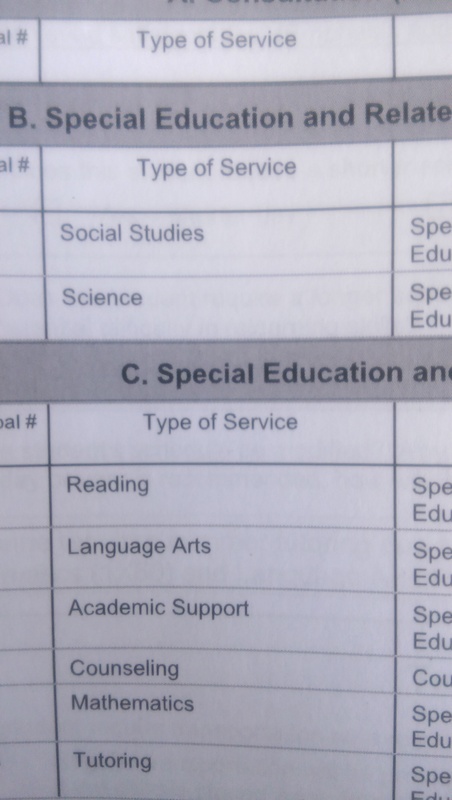 “Service” means anything that is provided because of your child’s eligibility for special education. The Service Delivery Grid has three sections, divided into groups of rows: A, B, C. We refer to them as – can you guess? – the A Grid, B Grid, and C Grid. When we think about services in special education, we specify whether the child gets the service in a classroom with general and special education students combined or whether the child gets the service in a room of special ed students only. Let’s look at those alphabetical grids. The A Grid – This actually refutes what I just said. The A Grid isn’t about your child getting a service, but is about provider-to-adult contact. I haven’t used this section much in my teaching. I’ve inherited some IEPs with A Grid items, but that’s about it. In this section go “consultation” services from one professional to another professional or to parents. It might mean that the special ed teacher talks to the general education teacher, or that a therapist talks to the special education teacher. It might be counseling that is provided to the parents. The B Grid describes services that happen in a general education setting. If your child is in a general education class and has a specialist in the room, that direction goes here. The C Grid is about services for your child that happen outside the general education setting. That’s the big picture of the Service Delivery Grid. The grid divides services into rows that describe who is getting the service and where the service occurs. Well, we’ve run out of alphabetical rows, so that’s it for now. Next time, we’ll learn about all the pitfalls that can occur in those innocent-looking columns. Think the Black Lives Matter movement has nothing to do with special education? Newsobserver.com reports that although nonwhite students comprise 45% of total school enrollment in NC, they comprise 85% of enrollment in 50 of the lowest-performing schools. If a nonwhite student performs poorly, it could be argued that since other students in the cohort perform poorly, there is no problem. No disability. No need for special education services. In other words, since so many of these kids underperform, not many of them have disabilities. Schools need money. If schools don’t have as many kids in sped programs, more money will be freed for general education. The way to do that is to limit the kids who qualify. So. 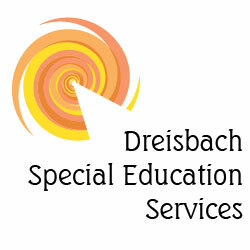 Your child’s eligibility for special education is not only a function of his/her ability. It is a function of where you live and go to school. And now it also depends on your looks. This tell you which section of the IEP that you’re in. This tells you the number that this page was as part the print batch. You’re in your annual meeting and a teacher says, “On IEP 4..” You turn to the fourth page. You’re looking at a list of accommodations. The teachers are talking about annual goals. What is going on? Why aren’t they looking at the fourth page? Welcome to the world of IEPs. As the photos above show, “IEP4” is written at the bottom, as if it were the fourth page of the IEP. “Page 4 of 30” is also written, as if this were the fourth page of a 30-page IEP. You count, and neither page is actually the fourth page of the IEP. You’re right. 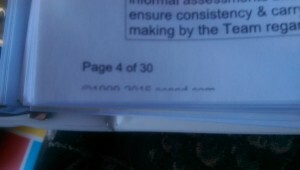 Neither page number describes the fourth page of the IEP. Well sometimes it does. 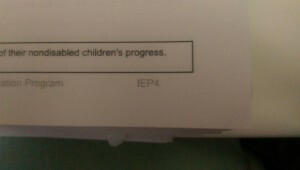 The teacher was referring to the fourth section of the IEP, not the fourth page. That’s what “IEP4” means. “Wait,” you say. “I thought the whole thing was an IEP.” Once again, you’re right, but.. Every specialty has its jargon. And the “Page 4 of 30”? That refers to the number of pages that were printed at one time. Often, the cover letter that came with your IEP was part of that printing, so the letter is page 1. Your IEP might not start until page 4. To make it even crazier, I have sometimes made a change to a section in the middle of an IEP. In order to send to the parent, I have reprinted that section, and then inserted the revised section into the rest of the IEP. I really should print the whole thing again – and most of the time I do – so that the parent doesn’t go from page 5 of 30 to page 1 of 2, then back to page 7 of 30. But sometimes I just don’t want to kill any more trees. So that’s the scoop on your IEP pagination. If each section is only one page and if this was the only document printed at the time, then the numbers at the bottom will be the page numbers of the IEP. Otherwise, you need look around the table to make sure you know what the teachers are talking about. Or your could sound very knowledgable about these distinctions and ask what the teacher means. I’m not a fan of using computers as rewards in “behavior plans.” Part of the purpose of a reward during class is to rest the student’s mind so that s/he can get back to work. However, the pace of computer screens can aggravate already short attention spans. Kids bounce from educational game to another, or from song snippet to song snippet. They can return to work with shorter attention spans, not with minds that have rested and are ready to reengage. Computers also take children away from the group. In an era when students sit at communal tables, where they have desks moved into groups, and where they discuss their answers with each other for assignment after assignment, it is ironic that we choose isolating computer screens as rewards. I had a student with a behavior plan (a plan that I inherited; not one that I created) where the student got to use a tablet as a reward if she earned a certain number of behavior points each day. As part of my teaching, I had introduced the students to chess. They played each other at the end of most days. A few weeks into our chess games, she asked if she could play chess instead of using the tablet. Though she initially had trouble with losing (and let’s face it – half the class lost each day! ), she created a coping mantra, “I’ll win next time.” It worked. She liked playing the other students, and they enjoyed having her with them. As the teacher, I liked that her reward was being with our community rather than leaving it. What did we use for rewards before computer games? It’s hard to remember. Did we read books? Did we draw? How do your kids recharge? What helps them to reengage? As the end of the year approaches, students of all ages have big projects due. Some kids are nearly done, some are struggling. It has ever been thus. In my classroom treks of substitute teaching, I have been seeing students helping each other. They cut out pictures for posters, find notes in disorganized binders, teach English to new immigrant classmates. Maybe it is due to teachers instilling an ethic of helpfulness in their classrooms; maybe it is parents teaching kids to be nice; maybe it is special education’s guiding principal of Least Restrictive Environment, where kids of all levels are learning together. Sometimes adults only see chaos at the end of a school year. When we slow down and watch, we might see the lessons and policies actually working. Spring has arrived, complete with flowers and snow here in the Northeast. It is also the season for teachers, administrators and parents to decide which students should attend summer school. In special education, teachers look for “substantial regression.” Substantial regression basically means that a child likely lose more knowledge over the summer than other students. Districts and schools often provide teachers guidelines on how to identify which students are likely to substantially regress. The decision is often a combination of data and the experience of seeing children learn and recall information throughout the school year. Who really needs summer school and why? If you are a parent and think your child needs or doesn’t need summer school, talk to the special education coordinator in your school. Get the facts and listen to the reasoning. If summer school is likely then it should have come up at your annual IEP meeting. Summer school is a part of “extended year” in the IEP. You actually signed on to the decision about summer school when you accepted your most recent IEP. But if you have a concern or question, you can absolutely still have the conversation. Teachers revisit “extended year” in the spring, especially for students whose annual meetings were in the fall. Revising allows teachers to update the IEP’s of students who are no longer likely to substantially regress and of students who now seem likely to regress. Like most IEP changes, these updates need to have parent/guardian permission. If you haven’t heard about summer school yet, start asking – before the summer flowers appear!